All Orders allows you receive payments on orders and shipping documents. If the payment method that is assigned is a credit card you will be able to enter the relevant credit card information. In addition you can process the credit card within All Orders. To get started, log in as the administrator and go to the Company menu and select Preferences. In the preferences screen select Payment. Here you can select from the supported gateways. You must already have an account open with one of the gateways before you can use it in All Orders. After selecting your gateway be sure to follow any additional instructions and enter any credentials that may be required. Check Warn if saving a credit card payment and the card has not been processed if you want to be prompted to process a credit card before saving any payment information that includes a credit card. You should keep this checked if every time you enter credit card information in All Orders you want to charge the card. If there are times when the card will be charged outside All Orders, for example in a virtual terminal, you may want to uncheck this. 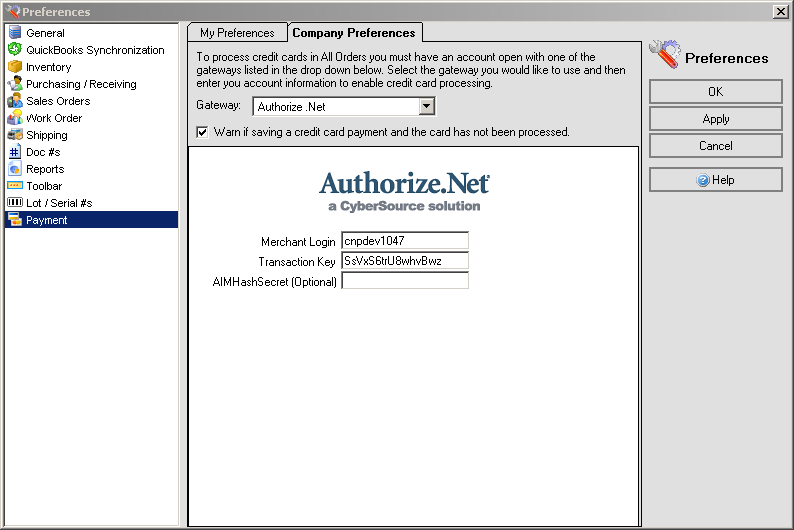 Once you have setup your gateway you can start processing credit cards when taking payments. Cards can be authorized & captured or charged. After a card is processed the option to either void the transaction (if the transaction has not yet settled) or credit the card (if the transaction has settled) will become available. You can also click the Swipe button if you have a credit card reader connected to your machine. Once you click Swipe the machine's input will be prepared for the card to be read and you must swipe the card. Clicking anywhere else on the screen will cancel the swiping. Click View All Related Gateway Transactions to see a history of all the transactions that were processed on the order or ship doc. If on a ship doc, any related transaction that took place on sales orders that are being shipped will show as well. 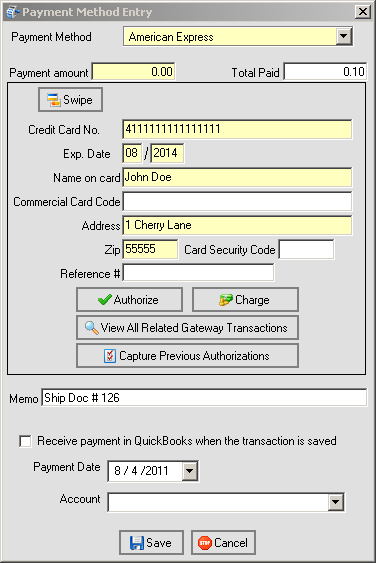 If entering a payment on a ship doc you will also see the Capture Previous Authorizations button. Click it to view a list of all open authorizations from related Sales Orders. Highlight one and click the Capture Selected Authorization button to capture it.